After five months of writing match previews and bet recommendations both in the English and German language versions of Betfair’s blog, it is time to review the results and ultimately compare them with Betfair’s own odds (i.e. 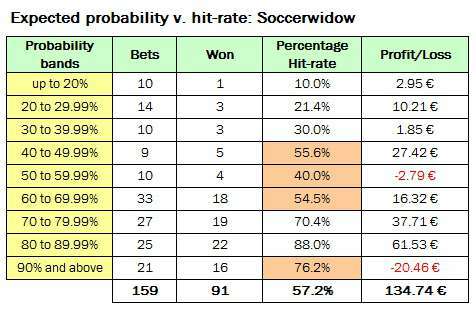 predicted probabilities) and hit-rate. All of our Betfair articles have centred around the principle of ‘value’ betting, in other words, finding through statistical means a mathematical advantage or ‘edge’ over the odds on offer and always backing when the odds are over value or laying when the odds are under value. A whole range of value bets were posted in our Betfair articles spanning the entire probability spectrum (i.e. 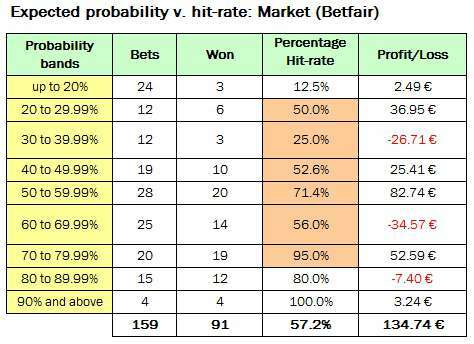 not just showing bets with a very high probability of success), and we will also see later in this piece how accurate the hit-rate to probability ratio actually was. You can clearly see the growth curve is not a smooth line but is rather jagged, showing a few phases where losses were incurred. However, despite the occasional dips, growth has continued unabated for five months. Throughout our experiment a level win/risk staking plan was used. This means the stakes employed depended upon the individual odds, but the maximum risk and attainable profit were constant. Depending on the odds, our wagers were always limited to a maximum risk per bet of 10 units, and where necessary also ‘weighted’ to win a maximum of 10 units. Back Bets at odds of up to 2.0: Example 1.69; the stake (risk) is 10 units; if the bet wins, the winnings are 6.90 units; if bet loses, then 10 units are lost. Lay Bets at odds of up to 2.0: Example 1.69; winnings are capped at 10 units; if bet wins, the winnings are 10 units; if bet loses, the loss is 6.90 units. Back Bets at odds over 2.0: Example 3.5; winnings are capped at 10 units; if bet wins, the winnings are 10 units; if bet loses, the loss is 4 units. Lay Bets at odds over 2.0: Example 3.5; loss is capped at 10 units; if bet wins, winnings are 4 units; if bet loses, then 10 units are lost. From 159 bets a total net profit of 134.74 units was obtained from a starting bank of 50 units. The starting bank was turned over several times with turnover totalling 1,199.89 units at the end of five months. The average ‘Yield’ was 11.2% (profit divided by total stakes), or an average of 0.93 units won per bet transaction. The proportional increase of the 50 units starting bank computes to 269.5% (ROI 1) over 5 months, meaning that the initial bank has nearly ‘trebled’. The average rate of return per month (ROI 2) calculated to 30.1%. In five months a total of 393.67 units was lost and 528.41 units won, corresponding to a profit of 134.74 units. 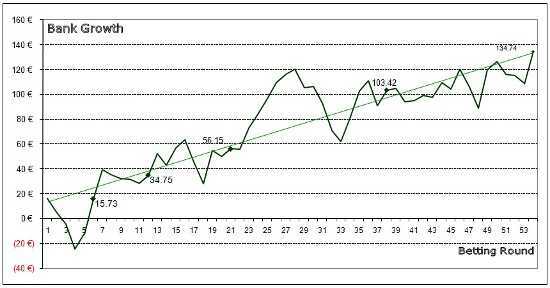 The mathematical advantage (value) was therefore 34.2% (134.74 units net profit divided by 393.67 units lost in achieving it). Using the 80-89.99% cluster group as an example, if enough bets are placed then a sufficient number will accumulate in this cluster group with the expectation that, for example, from 100 bets placed in this group, 80 to 90 will win and no more than 20 should lose. The 159 bets distribute themselves unevenly into the nine different probability clusters, and as expected, since the sample sizes are still relatively small the achieved hit-rates do not correspond exactly with the calculated expectation (those highlighted in pink). However, it is clearly recognisable that the deviations are not enormous except maybe in the 50-59.99% group and in the over 90% cluster. The 50-59.99% group contains only 10 bets and 40% accuracy is therefore not really meaningful. More significant is the 76.2% success rate in the over 90% cluster, since the group is represented by 21 bets. This could be an indication that there may be errors in the probability calculations and/or bet selections. This group needs to be monitored more closely. What a comparison! Apart from the last two cluster groups of highest probability bets, and the one cluster of lowest probability bets, none of the other ‘Betfair’ clusters performed within probability expectations of the odds, which is a strong indication that Soccerwidow’s approach actually picks and recognises errors in the market odds. In other words, our method of compiling odds is more accurate than the users of the betting exchange meaning that we can continue to take advantage of the frequent odds ‘errors’ or ‘deviations’ and make money using the ‘value’ approach. If you wish to learn how to carry out your own value bet analyses please browse further through this blog as it is full of articles describing bookmaker maths. The spreadsheet relies on inputting historical results for the game you are analysing in order to see how accurate the odds are being offered by the market. The formulas do the rest and display the value bets available for more than 100 betting options (including Asian Handicap HT and FT), leaving you to decide which ones to include in your portfolio. Thanks again for taking the trouble to write to us. I will try and shed more light on some of your queries. Firstly the non-betting related subject. Yes, we use WordPress ourselves and find it to be an ideal blogging platform. Our theme is Forester but there are literally thousands of themes to choose from, some free and some at a premium. I am sure you will make a success of your own blog! Next, all of our value bet systems are full-game strategies involving no trading out whatsoever. Trading out to guarantee a smaller win erodes profits and therefore defeats the whole point of value betting, which is simply a numbers game. By spreading your risk (having as large a portfolio of bets running per betting round as you can) betting on as many events as you can find with high value and high probabilities should generate profit organically without having to spend further time monitoring the games waiting for an ideal moment to trade. Lastly, our staking plan is always under scrutiny and recently we have considered using the staking plan recommended in our article above only for odds up to a certain figure, say 5.0, and then to use a fixed staking plan for odds over this threshold. We will be publishing an analysis of this idea soon, as it seems a logical way of maximising winnings further. However, fixed staking plans on all bets like the one you suggest present a higher risk of losing money quicker if you get onto a losing streak. Better to be conservative with your staking plan and forget the word ‘aggressive’. You only need patience. Of course, if you adopt our staking plan approach you can use as many points per bet as you like, so long as you bet constantly at the same points risk/profit weight. Thank you once again for your answers to my emails…it has been until now super useful. You asked in last mail if i was winning already…and the honest answer is…No i’m not. I´m trying for the last 2 years with sports trading…for some reasons that i spot and others that i didn’t understood until now I’m losing. I was introduced to the term “value bet” some time ago on a different site but I always had some problem understanding why trade out if I had that mathematical advantage already…and maybe i don’t have that “magical skill” that makes you know during a match if it is better to trade out or not. So i decided to search for another approach in the betting world. And I found your site…it was like I could fill in some blank spaces that I had before…and almost everything makes sense now…theoretically of course. I’m now working on statistics and planning next season. This last year was important of course…I made my path, didn’t give up and above all else remained disciplined…I’m sure now is the time for that to pay off. By trade I’m a Physiotherapist but my wife says that she never sees me so happy as when I’m working on football statistics. And I know that I have a lot of work to do to be prepared for next season…and a lot of work during the season. I’m planning to create a blog so i can share my results…do you have any blog host that you could recommend to me? I’m thinking about WordPress. And of course I have a question for you…in your 5 month resume you explain your staking plan and it has made me curious. I was thinking to adopt for next season a fixed liability…lets say on a 100 point bank, a constant liability on each bet of 1 point. what do you think about it and what are the advantages that your staking plan can have? I was thinking to bet only where i can find 15% value or more…do you think it’s too much? and do you think i can be a little more aggressive with my stakes? i hope this mail is understandable. thank you for your attention. Very well written and well presented piece. I have been musing over adding a pre-game statistical trading element to my trading for a while now but have still not got around to it. Are you going to be covering the Euro 2012 championship? Thanks for your kind words, Paul. yes, we are planning to cover some Euro Championship games this summer and are contracted to write for Betfair Germany on several games involving England, Russia and Ireland and probably a few more in addition. 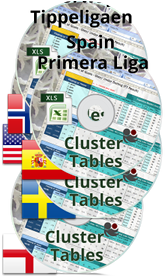 We will also be looking at Scandinavian football and North/South American fixtures where stats can be found. We don’t need to know anything about the games really, just figures showing what has happened in the past, so our own betting is entirely unemotional and is purely a numbers game. We don’t have time to worry about the effects of Rooney’s tight hamstring or any other extraneous factor! Thanks for your interest in Soccerwidow – let us know how you get on with your betting – we always like to hear about success stories and on the other hand try and help where people have been less successful. Best regards.